Mulund-based Umang Foundation (UF) was set up by three young and enthusiastic IT professionals, employed full-time with one of the leading investment banks in India. A cohort of 40 people (friends of founding members) were involved in seeding UF in 2008. UF conducts a diverse range of activities like medical camps in underserved schools, blood donation camps for corporates, drawing competitions for children, etc. While these are just one-off events and are somewhat directly correlated to availability of funds, distribution of essential education materials to school children – ‘Promote Education’ – has always remained UF’s priority since 2010. The project is financially supported by corporate donors (ICICI Securities, DCB Bank etc.) and executed by volunteers. Sector and Positioning: UF works with underserved schools in and around the Mulund-Thane belt. According to founder Mr. Ashish Goyal, UF is the only volunteer-driven NGO in Mulund distributing stationery kits directly to students in a neatly packed eco-friendly bag. UF identifies and distribute kits to schools with a high student dropout ratio. The organisation is uniquely placed as far as execution is concerned; this is because at any given time UF has access to 40-50 committed volunteers. Outcome: From just 550 kits distributed in 2009, UF distributed 12,856 kits in 2015 (Rs300 each, customised for 5 different age groups), a 22x increase in beneficiaries reached. Teachers across schools have reported that the attendance has improved and the dropout ratio has declined. This is because children are now equipped with required stationery items, and excited to use them. However, there is no data available to support this statement. The success of this project fetched them an entry into Limca Book of Records in 2013. In addition to this, 145 students receive coaching in spoken English every Saturday under UF’s Umang Gurukul Project. Through 100+ blood donation camps, UF has collected 18,000 blood bags and 5,741 bottles of blood till date. 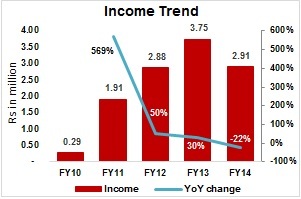 Financial Performance: UF’s income dipped by 22% YoY from Rs3.7mn in FY13 to Rs2.9mn in FY14. Mr. Goyal shared that grants from corporates accounted for 70%-80% of income and the balance was from individual donors. 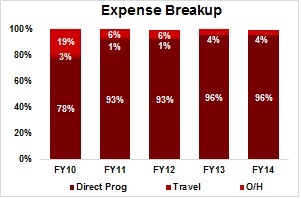 He further added that UF had 60% repeat donors in FY15; suggesting corporate India’s faith in UF. 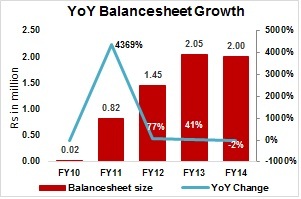 Spend on beneficiaries remained at 94% - 96% level since FY11. He shared that 90% of program expenses were spent on various activities including stationery kits for students and 10% on blood donation camps, clothes distribution, etc. UF has zero salary cost; and since they operate from the founder’s residence, this further helps keep overheads minimal. UF has no plans to appoint full-time employees, nor operate from another office in the near future. Therefore, it is safe to project that spend on beneficiaries may continue to remain higher than 90% in the coming years. Corporate Governance and Reporting Standards: The Board consists of four trustees, of which two, Mr. and Mrs. Goyal are married; whereas the other two trustees are father and son. The rationale to have a closely knit board is to avoid complexities and remain focused. UF has a policy to appoint a new auditor every three years. Board meetings are held on a quarterly basis and the minutes are documented. Major Challenges / Improvement Areas: Assessing impact and communication with corporates are the only two areas UF is battling with at present. UF is looking out for volunteers who could add value in the above two areas. Other than these two, UF faces no challenges on the execution front.